“I AM A GENIUS!” is a “motivational learning musical and education pep rally” that focuses on academic achievement, school safety, health, and physical fitness. In this performance, Ekpe features songs and stories that help students do their best in school, at home and in life. . “I AM A GENIUS!” is an “affirmation rap” that encourages children to believe in themselves and their ability to learn. “IT’S FUN TO READ, IT’S FUN TO LEARN” promotes literacy and celebrates the joy of reading and learning. “THANK YOU FOR TEACHING ME” helps students have greater respect for teachers and establishes a wholesome bond between the two. “CHE CHE KULE” is a song with movement that teaches mathematics. The “DON’T TOUCH A GUN” song saves lives by telling children what to do if they see or hear a gun. “BUCKLE IN, BUCKLE IN “ is a fun song and dance that saves lives by getting children (and adults) to develop the habit of buckling their seat belts. “DRUG ADDICT” communicates to children the dangers of illegal and “legal” drugs. “I AM A GENIUS!” gives children the tools for developing life-long safety, health and learning habits. This program promotes self-esteem, character education, creative thinking, conflict resolution, drug and gang prevention, while interspersing academic requirements of math, science, language and listening skills. 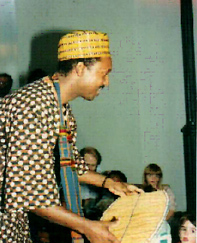 In “THE SPIRIT OF AFRICAN MUSIC”, Ekpe involves the audience in motivational songs, stories and rhythms as they learn how music celebrates life in Africa. With African drums, flutes, bells, shakere (gourd rattles) and kalimba (thumb piano), this program is a crowd pleaser from the first drumbeat to the last handclap. As a cultural diversity program, “THE SPIRIT OF AFRICAN MUSIC” is a natural introduction to African arts, history and culture while enthusiastically weaving in mathematics, science, language arts, creative thinking and cooperative learning of African civilizations. This is an excellent whole language presentation suitable for all ages. “THE SPIRIT OF AFRICAN MUSIC Celebrates KWANZAA!” is available during the month of December. In Kiswahili, “KWANZAA” means “first fruits” and focuses on the Nguzo Saba or “Seven Principles.” which are Umoja (Unity), Kugichagulia (Self-Determination); Ujima (Collective Work and Responsibility), Ujamaa (Cooperative Economics), Nia (Purpose); Kuumba (Creativity) and Imani (Faith). How did the music get “ FROM AFRICA TO BEALE STREET?” Who is the “Father of the Blues?” Why is Memphis known worldwide as the “Home of the Blues?” This enjoyable program involves the audience in the rich legacy of Black music. Experience how the Africans ingeniously used music to escape from slavery to freedom and in the process created new music, instruments and art forms that have spread all around the world.